To save disk space, all photos in this Gallery are low-resolution (600x400) JPEGs; If you would like a high-resolution version of an image(s), please email me. Tip: To go to the next page of albums or photos, click the next button ( ) or the page number (both below). Last changed on 01/26/2014. This album contains 18 items. This album has been viewed 4340 times since 11/10/2004. 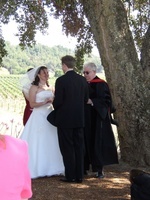 Pauline and I were honored to witness the marriage of two good friends, Barbara Engelhart and Warham Lance Martin, in beautiful Healdsburg, CA (wine country). Last changed on 01/26/2014. This album contains 15 items. This album has been viewed 3950 times since 06/04/2004. 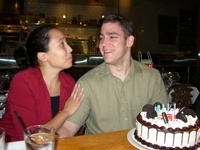 For my 26th birthday, a group of friends gathered for dinner at Il Fornaio in Old Town Pasadena. Unfortunately, as the photos in this album demonstrate, I'm not very photogenic. I still cannot seem to smile "naturally" for the camera. Last changed on 01/27/2014. This album contains 11 items. This album has been viewed 4000 times since 06/04/2004. 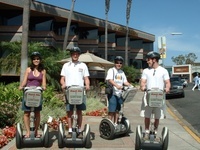 Pauline, Tim, and Dominic surprised me with a trip to San Diego where we rented Segway Human Transporters. We spent several hours driving them around the La Jolla beach area. It was alot of fun! I wouldn't recommend buying one of these machines, but they sure are neat to try out, especially if you're an engineer at heart. Last changed on 01/27/2014. This album contains 35 items. This album has been viewed 5536 times since 11/10/2004. This album has been viewed 4029 times since 10/21/2002.